What Are the Chances of Hitting a Deer in Your State? 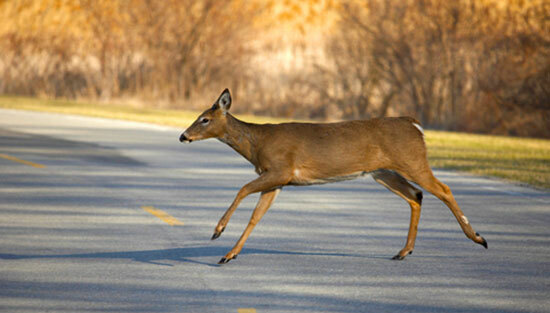 Drivers near wooded areas know to always be on the lookout for deer, but even the most cautious drivers are still at risk of accidentally colliding with one of these animals at some point. Now, a new study has found that drivers in some states are far more likely than drivers in other US regions to have an unfortunate encounter with a deer while driving. The study, sponsored by State Farm, uses claims data as well as national deer-related accident reports to determine your likelihood of colliding with a deer in the next 12 months. The recently-released study ranked each state based on their odds. One noteworthy finding from the research—if you live in Pennsylvania or West Virginia, you have some of the highest odds in the country of hitting a deer within the next year. While some states' rankings are to be expected—like Hawaii's (#51), where citizens are three times more likely to be struck by lightning than to hit a deer—your own state's ranking may surprise you. See the complete list of state rankings. Drivers in these states should be especially cautious during October, November, and December. During mating and hunting seasons, deer are even more likely to take to the roads. Plus, as days become shorter the lack of visibility at night also increases your odds of a collision. If you or a loved one was injured in a car accident on a dangerous Pennsylvania road, you don't have to assume the accident was your fault—you may have a case. Our investigators know what evidence to look for to prove that weather, poor direction, or bad road conditions may have caused your accident. Contact us immediately at 1-866-943-3427 or submit your information online with the form at the top right corner of this page for a free legal consultation. The consultation is free, the advice is free, and as always, there's never a fee unless we get money for you. Source: “Driver’s beware: the odds aren't in your favor.” State Farm. September 15, 2014.